CD6-18 –The Heavy What's So Good About Goodbye? Limited to 3500 numbered box sets. - 1 x book "Ninja Tune: 20 Years Of Beats And Pieces" (hardback edition). Track 4 on CD2 is in the booklet wrongly written as "Stateless - Ariel (Rustie's Pentagram Remake)". Track 4 on CD5 is wrongly listed as "Bonobo - Eyesdown (featuring Andreya Triana & DELS)" but features only DELS vocals slightly out of sync. P & C Ninja Tune MMX. Beautiful set all around and a real joy to own, but curious if anyone received more than the first two 12" samplers as part of the membership mailers? I see that there are 5 listed, but I only rec'd ZEN160XX1 and ZEN160XX2 a few months apart via mail. 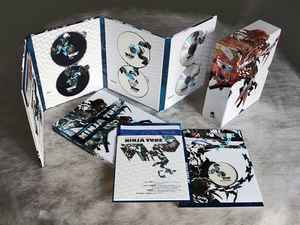 I think Ninja Tune have produced one of the best anniversary box sets ever produced by any record label. They didn't bother with a 'greatest hits of Ninja Tune' - instead, they undertook the ambitious task of having artists produce NEW material, and have existing Ninja Tune favourites remixed by label, and, non-label artists. The end product is a very well designed, comprehensive package, that gives the music supporter a lot for their money - especially considering some of the ridiculous box-set compilations I've seen in the past. Musically, there are some really amazing pieces here. In all honesty, I am not a fan of some of the material included, but this just makes the overall listening experience a nice variance for me. Overall, for the box set design, retail price, and all the bundled goodies, I give this package a 5 / 5. Musically, I'd give it a 3.5-4 / 5. If you're fortunate to be able to get the box set, I do recommend it! if ya missed this awesome box, be fast.. ninja tune is givin away the last remainin stash right now for just £100.00. From the beginning, the box itself is just gorgeous, hours of reading pleasure and hours of excitement to come. The Music Takes You Up (in Mr. Scruffs words) from mind blowing scary sound capers, to bass heavy gut wrenching bowel ticklers, to more traditional ninja style down tempo lounge groove, you get gripped by the balls and sliced up like a ninja's salad, only to be cuddled and stroked by your stealth mummy. Post review or comment? With this tracklist and record company? Pcha, it's only waisting of time. Put your earphones on (or turn your aplifier) and let's have a PAAAARTYYYYYYYY!!! !